Mystery. Magic. Oversized phones and cameras running Android. If these are things that make you happy, then Samsung's Mobile Unpacked event from today will be the best hour and half you can spend staring at your computer's screen (short of reading AP, of course). And just in case you weren't able to catch the live stream during the event today, Sammy has now made the entire thing available online. Now you can see first hand what happens when Samsung, a couple of magicians, and and MC who talks louder than everyone else get together. 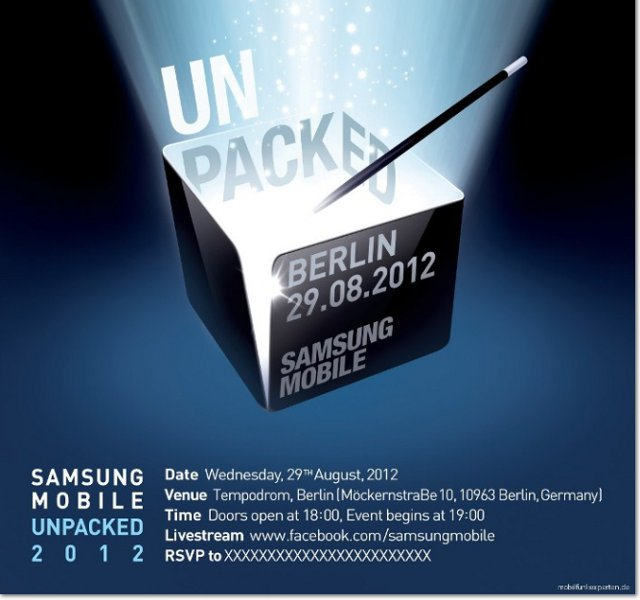 Here's some promising news for your Friday the 13th: according to Korean news source Digital Daily, Samsung has scheduled its Unpacked 2012 Episode 2 event for August 30th in Berlin, Germany - and the Galaxy Note 2 is said to be the star of the show. For the unaware, Samsung holds Unpacked events to unveil its newest flagship devices - like the Galaxy S III, which was announced at the first Unpacked event earlier this year.